You see, silver took a hit in July, sinking 3% after an unseasonal June rally. This decline, though, is not a bad thing – it’s a great opportunity to buy silver. With silver trading at just under $20, there’s a lot of potential upside after summer winds down. “For me, when [trading] stays kind of muted, then there’s great opportunity where you don’t have to rush in but you can step in,” Richard Checkan, chief operating officer (COO) of Asset Strategies International in Rockville, Md., told Money Morning. Here are three reasons why we’re buying silver now. When exchange-traded funds (ETFs) bulk up on silver holdings, the silver price rises – just as it falls when ETFs dump the metal. In the first six months of 2013, ETFs shed 5.2 million ounces of silver, representing a 0.8% decrease in physical holdings, according to data from Thomson Reuters. Silver then plummeted. The silver spot price dropped close to 40%, to just below $18.50, by the end of June. But from then on, ETFs reversed course. For the last six months of 2013, these ETFs’ holdings increased by 6.7 million ounces. For the first six months of this year, the trend continued and ETFs added another 7 million ounces. In the yearlong period that followed the ETF selloffs in 2013, physical holdings grew 2.2%. Unsurprisingly, silver prices began to turnaround. From the end of June 2013 to the end of June this year, silver was up 7.7%. July did see a slight drop in ETF silver holdings, but the bulk of that action was due to profit-taking after an uncharacteristic silver price rise in June. ETF silver holdings are still up despite this slight July hiccup. Reason No. 2 to Buy Silver Now: Momentum indicators signal upcoming gains. The relative strength index (RSI) measures the scale of recent gains versus the magnitude of recent losses, and serves as a momentum indicator for when an asset is overbought or oversold. Its levels range from 0 to 100, though traders typically zero their focus between 30 and 70 when analyzing the RSI. As the RSI approaches 70, it is an indication that the asset is becoming overbought and is due for a downward correction. On the other hand, it is considered oversold as it approaches 30, and is readying itself for an upswing in momentum. 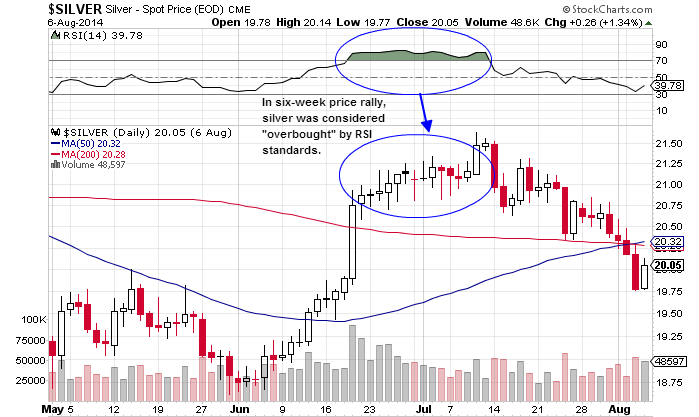 As the chart shows, between mid-June and early July, as silver was experiencing a six-week rally, the RSI indicator suggested that silver was overbought and prices eventually adjusted accordingly. Since then, the RSI has been steadily approaching that crucial 30 level. When investors see that the white metal is oversold, it could trigger a buying spree and help push up silver prices. While only a short-term indicator, Money Morning Resource Specialist Peter Krauth said it’s important that even as prices currently languish and trade in a small range, silver will need to hit an important $22 benchmark to set a new standard and attract a more aggressive bull run. The run at $22 could begin as the RSI correction takes hold, and the longer term price increases will follow. Reason No. 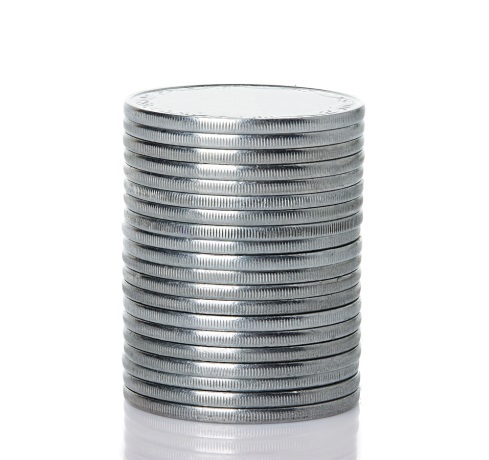 3 to Buy Silver Now: The silver price is unencumbered by a long-standing fixing mechanism. After 117 years, the process of setting the daily price benchmark for spot silver, known as the London Silver Fix, is coming to end. The system involved three banks, Deutsche Bank AG (NYSE: DB), HSBC Holdings Plc. (NYSE ADR: HSBC), and The Bank of Nova Scotia (NYSE: BNS), which comprise London Silver Market Fixing Ltd. The process begins when the fixing committee chairman first determines a benchmark price for silver. From there, he will collaborate with two other members to determine at what price selling interest and buying interest in silver are equal. This is done through a conference call that happens every day at noon. But free market advocates have long been critical of this process, which they say lends too much authority to a small coterie of banks, and works to artificially price silver. Scott Nicholson, a Washington D.C. investor brought a lawsuit to a federal court in Manhattan last week, alleging that these three banks are manipulating silver prices. In the spring, Deutsche Bank retired its position from the silver fixing committee, prompting the other participants to abandon their posts as well. The London Silver Fix will shut down on Aug. 14, in just one week. The new process for setting silver prices aims to be more transparent, in the face of claims that the previous mechanism was conducted in secrecy. The two participants will be Thomson Reuters, which will be in charge of administration and governance, and the CME Group, which will provide an electronic auction platform that will determine prices by an algorithm, as opposed to an individual decree. If the silver fix’s critics are right, this change may provide an opportunity for silver prices to move more naturally with the market. And with demand fundamentals still strong, right now may be a perfect opportunity to buy.